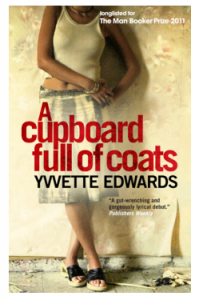 Yvvette Edwards’s debut novel, A Cupboard Full of Coats, is an elegantly structured story of guilt and redemption. Fourteen years after her mother’s murder, Jinx still blames herself for her role in the crime. She is living alone and in a state of emotional exile in London’s East End, separated from her husband and young son, when Lemon arrives on her doorstep unexpectedly: “He just knocked, that was all, knocked the front door and waited, like he’d just come back with the paper from the corner shop, and the fourteen years since he’d last stood there, the fourteen years since the night I’d killed my mother, hadn’t really happened at all.” An old friend of Jinx’s mom and her abusive husband, Lemon blames himself for the death. Lemon’s arrival sparks “some kind of voyage of discovery” for Jinx and Lemon as they spend the next few days revisiting old wounds and reliving past events. He’d cooked oxtail and butter beans for dinner, with small round dumplings the size of marbles, brought it to me in my bedroom on a tray, waited while I adjusted the pillows behind my back and smoothed a level space on the duvet for him to put it down. … The meat was so tender it fell from the bone, melting inside my mouth, the gravy spicy and so compelling I found myself unable to stop eating even when the plate was empty, sucking out every crevice of the bones, using my mouth like a bottom-feeder, my tongue like a young girl French-kissing an orange. The narrative alternates between the present day interactions of Jinx and Lemon and Jinx’s memories of her mother’s last months of life, culminating in the events leading up to her violent death. A Cupboard Full of Coats is a masterfully structured novel, building suspense even though the ending is revealed on the first page. Impressive in its psychological complexity, this is one of the best novels I’ve read this year. A Cupboard Full of Coats is published by Oneworld Publications.